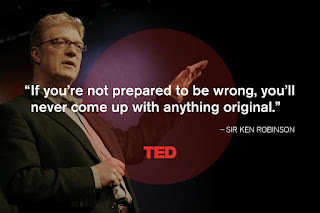 Ken Robinson, godfather of unusually-used paperclips, is back. He's famous to millions of educators as the author and speaker behind the RSA animation 'How schools kill creativity', which among other awards, is also winner of 'the most superficially convincing but ultimately brainless education clip'- joint winner with Shift Happens. You might have seen him at a TED conference, if you're extremely rich, or on Youtube if you're not. I've never really understood the Cult of Ken. He's affable, intelligent, charismatic and passionate about helping children. But unfortunately he's also quite wrong in many matters regarding them. The Tiger Teachers of Hong Kong: a warning, not a lesson. I turned down a job teaching in a Hong Kong school a few years back. If I'd seen Tiger Teachers (Unreported World, Channel 4) before I responded, I might have thought twice. The Chinese island has seen such an explosion in after school tutoring that celebrity super tutors have emerged, some of them earning millions of pounds every year. The Royal College of Teaching. Open doors and Games of Thrones, but this engine runs on hope. One of my deeper shames is that I possess a certificate for NLP (see below). Worthless, utterly without value. Everyone at the course got one, which means that it's as precious an accolade as the sensor that toots when I walk into my local newsagent. You turned up? Congratulations, welcome to the Star Chamber. It's like getting a 'Yes' from David Walliams.